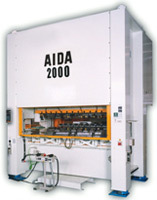 Straightside Presses in both Crank and Link Motion Unitized straightside frame for minimal frame elongation. The NS2 Series is available in both crank motion and link motion models. 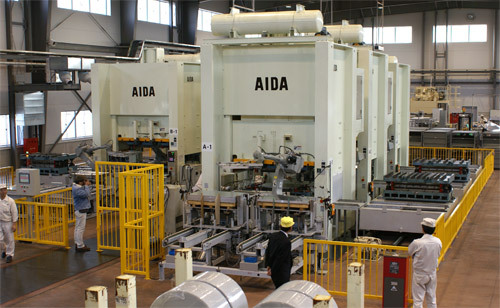 The AIDA NS2 has a unitized straightside frame for minimal frame elongation (up to NS2-2500, NS2-3000 frame assembly construction tightened by tie rod). A forced circulation lubrication system, introduced to the crank bearings and the slide guides, improves Bottom Dead Center repeatability - by minimizing thermal expansion of the frame. Higher productivity is achieved with an increased maximum SPM of 10%. 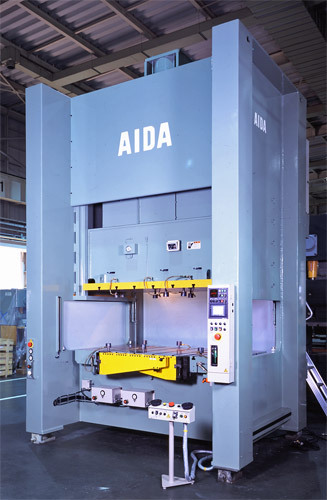 Link motion, perfected by AIDA through decades of experience and engineering, expands the range of metal-forming possibilities to include difficult-to-form materials, and makes possible extended die life and low production noise levels. Full guiding, via the full-length slide guides, provides high performance that is resistant to eccentric loads ensuring high accuracy at Bottom Dead Center and extended die life.